A rock, scree and snow slope peak, climbed preferably from a high camp in the basins at the head of the Anti Crow River. Climbed from high basins at the head of the Anti Crow River. 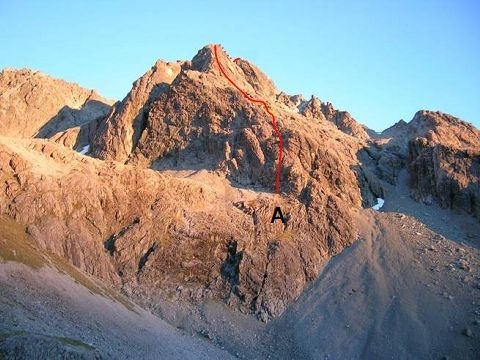 This nine pitch route starts on the extreme right hand end of a large and obvious bench accessed from basin above the waterfalls at the head of the Anti-Crow River. It then follows through a short steep section then follows slabs angling left until on the main arête. The rock is excellent; compact greywacke, great friction, but sparse protection available. From the top of the arête the route follows an easy but broken ridge over a short step to main summit. Feb 2013 Scrambled a line just right of the lower half of The Sunglass Route from the toe in the picture then joined the route to the summit. Nice rock. Traversed ridge and down scree to the east and Anti crow back.